The Confraternita della Spada di Firenze (CSF) is a Salle d’Arme affiliated with FISAS. 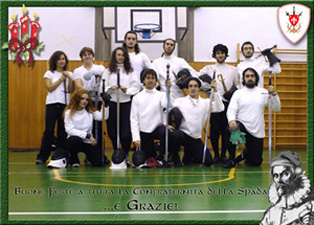 CSF is an association devoted to the practice of Italian Historical Fencing according to the Sinclair fencing Method, developed by M. Andrea Lupo Sinclair, founder of FISAS. Such practice is aimed at restoring those fencing systems that preceed the codification of olympic fencing, and considers swordplay a martial art (aimed at self-defence or duelling) rather than a sport. The CSF was born in 2000 at the Budokan Martial Art Center when M.o Stefano Agostini and a small group of practitioners decided to study the Western approach to martial arts. Initially presided by M.o Agostini, the CSF later became autonomous from the Budokan Center and its following President, Iacopo Iacoponi, moved the training sessions to another location. 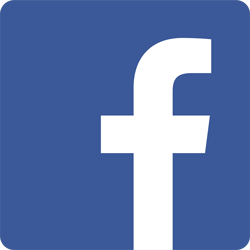 Over the years, two of the CSF students, Francesco Mannini and Marco Gentilini, became involved in running the association and later became teachers alongside Iacopo. 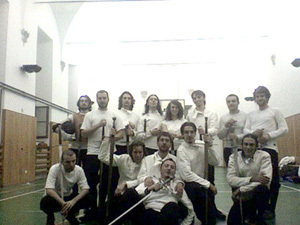 Today Iacopo, Francesco and Marco teach fencing classes in Florence and are members of the FISAS Teaching Academy, where FISAS instructors from all over Italy meet to train together, reaserch and study historical fencing. 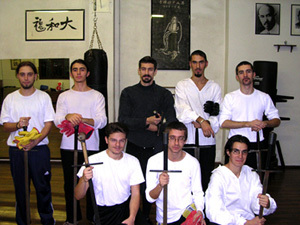 To these activities are added important annual events, such as the International Meeting FISAS, in which students, instructors and masters of armed or not armed martial arts, of international origin, gather to compare traditional methods or weapons and to stimulate research and practice of particular martial systems, often unknown to the general public. In addition our students are invited to numerous events of various associations twinned with FISAS throughout Europe.